Rightio, that is us done and dusted for the evening. But the Clasico is just getting spicy over on Neil Johnston's live coverage. Plenty of needle, but no goals just yet at the Nou Camp with half an hour gone. Get involved before logging back into all things Premier League for this evening's Match of the Day. Goals by the bucketload on Match of the Day this evening. Dan Walker will be serving them up in the following order on BBC One from 22:25 BST. “We switched off in moments"
Liverpool manager Jurgen Klopp: “I think we could have won this game. You cannot be satisfied after a draw, there were two world-class goals scored. First half was a stop-and-go game, we were brilliant at go, then stopped in concentration. We played passes that brought them back into the game. “We scored brilliant goal then Tottenham came back into the game a little bit because of us. “We switched off in moments. Nathaniel Clyne thought the ball was out and Dejan Lovren – who had a brilliant game – was not close enough for the goal. "It was an open and wild game with two teams with a good attitude." Tottenham manager Mauricio Pochettino: “The first half was equal but we played well. The feeling after the game is that we missed two points. I am happy and very pleased with the performance. “In the second half we were better, we had chances. Liverpool had chances too but I am happy. Today was a hard game. “It was difficult to come to Liverpool and get the three points. It was maybe difficult to score the second goal but we played to win and in football sometimes you can’t win every game. "We have not got the consistency"
Liverpool midfielder James Milner: “Both teams like to play a high-tempo passing game and we expected that. We probably created enough chances to win the game. We are disappointed not to win it. “Their goal came out of nothing. We have to be ruthless at times and take the chances. “When you are pressing so quickly, you have to calm down when you win the ball back. We are getting the style the manager wants us to play but we have not got the consistency. We should be doing it nine-ten times out of ten. 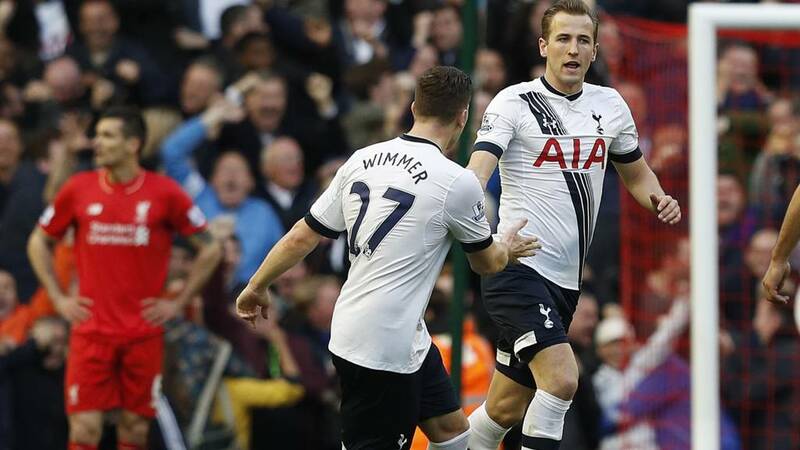 "It could have gone either way"
Tottenham striker Harry Kane to Sky Sports: “I think we are a tad disappointed. We wanted to come here and win and get the three points to chase the leaders. We got the goal back at 1-0 down and it is a shame we didn’t get the second. “It was an open game and about who could deal with the pressure better. We both created chances and it could have gone either way. “Christian Eriksen made a wonderful run and I just had to turn and get the shot off. I was buzzing to see it in the back of the net. “We are fighting for the Premier League, we will watch the Leicester game tomorrow and hope Southampton can get a result and do us a favour. We have done what we can do. The maths is not looking any easier for Liverpool to make the top four. They are five places and nine points off Manchester City, with a game in hand but both Manchester United and West Ham better placed to gate-crash into those CL spots. This is what the results means for the title race. Leicester's lead is down to four. But could be up to seven by tomorrow tea-time after they play Southampton. "Both teams deserve applause for that game, as they both played well but that result will probably suit Leicester City. The second half was better than the first and Philippe Coutinho's goal lifted Liverpool but galvanised Tottenham." A point gained for Tottenham or a point lost? In a normal season a draw at Anfield would be a decent result. But this is not a normal season. They are too high up the table and the gap to Leicester is too large. There is a sag in the shoulders of the visitors as they head back to the away dressing room. And Mauricio Pochettino punches the Anfield turf in frustration. Jordon Ibe on in place of James Milner for the last few moments. Toby Alderweireld's header is too clean a connection - whizzing into the boards when a glancing touch was needed at the near post. Simon Mignolet gets down to push away a trundling shot from Mousa Dembele that was sneaking in the far corner. Tottenham are the more likely as we tick into three minutes of injury time. Not quite the full Payet, but that was not far away. Christian Eriksen's free-kick swoops just wide of Simon Mignolet's top corner with the Liverpool goalkeeper motionless. Ryan Mason comes on for Dele Alli as we reach the squeakiest bottom times. Tottenham fans are chewing their fingernails down to the knuckle. A draw here, combined with a Leicester win against Southampton tomorrow, would leave them seven points off the top with six to play. Hugo Lloris was braced for the net to bulge. Rooted to his line, he watches as Philippe Coutinho's shot shaves his near post on its way wide from 15 yards. Jordan Henderson's thump warms Lloris' palms shortly after. Liverpool coming on strong. Five to play.